When all your celebrations are over this Independence Day, sink into the comfort of our Old Glory sofa. 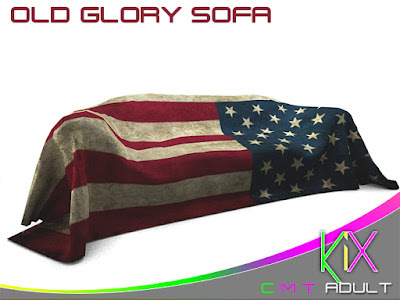 Packed with KiX original animations and with only a land impact of 2, how can you not treat yourself to popcorn, beer, wine and all the other fun props that come with this sofa. The adult version brings a different kind of fun but you can discover that for yourself.